Big hearts. Sweet moments. Making a difference. Yesterday's "Kids Making a Difference" event was a true testament to how big our kid's hearts are. And, a great reminder of how the little things, the little moments, are sometimes not so little. As I opened up class yesterday, I paused to find the right words. This class was all geared towards kids helping kids. Showing gratitude. Being thankful. Doing GOOD. And making a difference. But then as I looked out at the class, at the 20 mats in front of me, at their bright-eyed faces, I realized that I didn't need special words at all. For they didn't need special words or big explanations. Class opened with sweet and honest conversation about being thankful, about showing gratitude, and about doing kind things for others. We talked about how we wanted to do kind things for the kids at GiGi's Playhouse. We talked about how the kids at GiGi's Playhouse have the same feelings, thoughts, and happiness as we do. And finally we talked about the idea of making homemade calming jars for our friends at GiGi's Playhouse. We all hope that these jars bring happiness, a smile, and a sense of calm to our friends there. We all felt grateful to make them. We had a great, active class! Some friends new to Butterfly Kids Yoga, some friends very familiar. All coming together for a great Sunday morning yoga class to give back. And then we got to work! 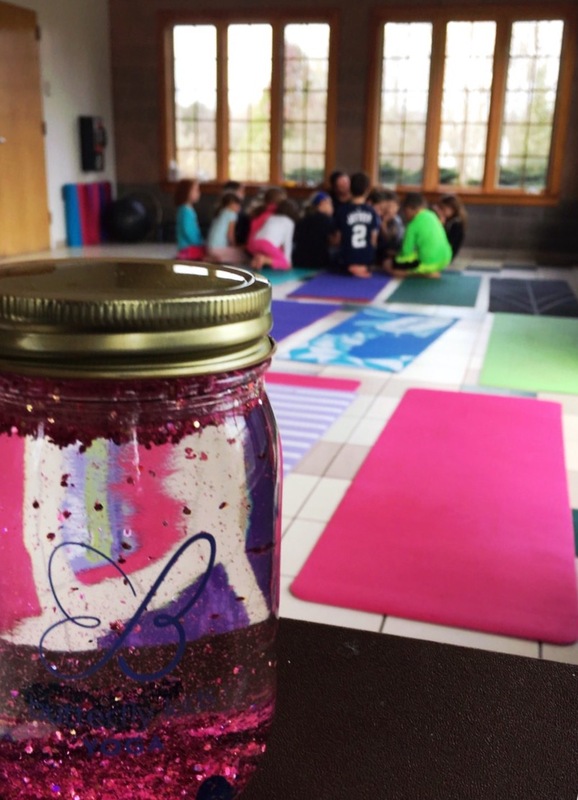 We worked hard on our Butterfly Kids Yoga calming jars. Everyone put their own creative touch on their jar, resulting in 20 unique and very beautiful calming jars -- all for the kids at GiGi's Playhouse. 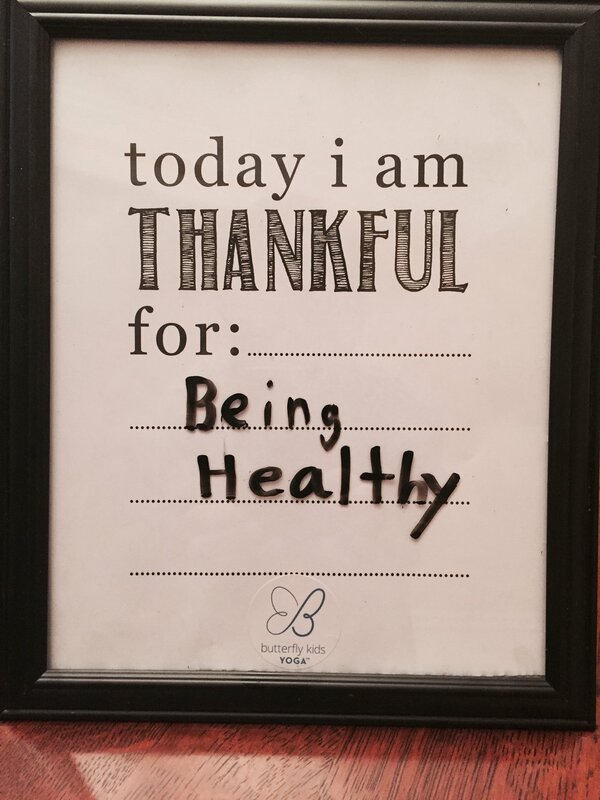 And as a take home gift, everyone left with their own "Thankful Board" -- a dry erase board to capture each day's reason to be thankful. Tonight's blog is dedicated to the kids of Butterfly Kids Yoga, their big hearts, and to the kids and families at GiGi's Playhouse. 'Tis the season for many reasons to be thankful and for all of those little moments that, at the end of the day, are actually the biggest moments of all. A great class for preschoolers! We'll get our wiggles out with active yoga and blend in sweet, peaceful moments to relax. 1x, 2x and 5x passes available. Click here to enroll. Join us for an active, fun yoga class which includes teamwork, balance challenges, and great exercise. Paired with time to re-center and relax. 1x, 2x and 5x passes available. Click here to enroll. Adult instructor (Mandy Wolfram, owner of Victor Yoga Studio) teaches a refreshing, rejuvenating class that is that great blend of a good workout + refreshing yoga. Perfect for all levels. 1x or 5x adult passes available. Click here to enroll. Don't forget! The 6:00pm class for ages 5-12 is happening at the same time (but in the room next door). Your kids can enjoy their Butterfly Kids Yoga class while you enjoy yours. A great 7-week session of classes for preschoolers as the weather turns cooler! We meet once a week and the kids love seeing their friends and having fun with active, music-filled classes. Enrollment is directly through the Perinton Rec Program. Click here for more info or to enroll.